Head out for a nice drink or six with your best rat-killing pals. 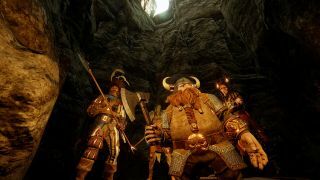 It’s Warhammer: Vermintide 2’s first birthday, and to mark the occasion, there’s a special Event Level that has the Ubersreik Five (or Four? Doesn’t matter) head out on the town on good, old fashioned bender. The new Event Level, called A Quiet Drink, is available now in the Keep. It begins with our rat-smashing heroes on the prowl for some ale. There’s plenty of that scattered throughout the streets, but this being the End Times, there are also plenty of clanrats, zombies, and Chaos Warriors catching the evening air as well. As these things so often do, it culminates with an all-out tavern brawl at a charming little pub called the Obese Megalodon, followed by a mad dash out through some subterranean tunnels. Fatshark has also produced a spiffy new One Year Anniversary trailer for Vermintide 2, and it’s worth a watch for any Warhammer fan. The whole thing is a gorgeous still-life shot through Vermintide’s rat-infested world depicted in lovingly-painted miniatures and dioramas, as you can see below. It’s as good a time as any to get into Vermintide 2, which incidentally was PC Gamer’s Co-op Game of the Year in 2018. A new expansion, which is called The Winds of Magic and adds the fearsome Beastmen, is due out this summer. Vermintide 2 is also free to play this weekend, and you can pick it up for 60 percent off the usual price.